Becoming a father isn’t hard, whereas being one is a whole different story. So n and father. From time to time that seems to be a difficult relationship. Filled with many held off feelings. Over centuries socializing a boy was carved mainly by the parole “be strong!“. Yeah, that’s how they were or were supposed to be, men and boys in former times: »Quick as greyhounds, tough as leather and strong as steel« It was Hitler’s perception of men that the fathers of the past century had internalized. Qualified for being a soldier and going to war in good spirit, there was simply no room left for child’s play. My father was also infiltrated by this image of manhood. 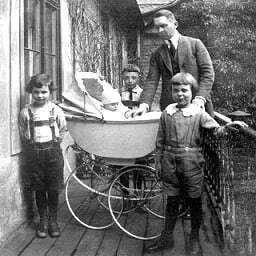 He would have never even considered pushing the stroller or bringing his only son to bed at night. Today many fathers are different. The image of the father figure has radically changed. According to the study from the German federal ministry of family affairs “Men in motion“ most fathers interact differently with their offspring: They cuddle, bring them to bed or strap them in front of their bellies when taking a walk. If today’s men refuse to hackle in the prenatal course they’ve disqualified themselves from being looked upon as modern men. We expect men to not only provide for the family but to actively being a part in their kids’ lives as they grow up. This dual capacity is not only expected by many women, the children and the social spirit of the age. A lot of men as well have set this as one of their targets. And sometimes they feel unable to cope with it. Making a career and having a family life at the same time has become a compatibility problem for men in our times. For women this issue has been on their list for a long time already. What types of fathers are there? A study two sociologists conducted bring on some insight on the different types of fathers which shows how the father figure has changed over the years and what impact it has on families today. 1500 interviews allowed them to make out six different types of fathers. “This father really feels his dedication put into question by the mother. He is convinced that his partner has no trust in his educational competencies and according to his perception the mother would basically even like to exclude him from having any relationship to the child. “These fathers feel cooperative, bond with the child, are patient and highly accepted by their partners. Fathers who are equals reject any kind of traditional stereotype and feel secure in their present role. “He sees his tasks especially in taking financial care of the family and thus lives completely in the sense of traditional behavioral roles. Questions about child care and education are primarily the woman’s job, especially emotional love. “The insecure, irritated father feels very alienated about his role as a father. Usually he reacts impatiently and extremely peevish when it comes to the child’s needs and therefore stands out, since he reflects the most problematic father-child-relationship of the study. “These fathers never made a conscious decision about having a family. But the paternity changes their identity fundamentally which is why the cooperative father aligns his life to doing his kids justice. 1. A father always has an influence. Even a father who ran out on the family after the son was given birth to or who was physically there but emotionally unavailable has an influence on a boy’s development. Because due to the empty space that was never filled by him he automatically leaves more room for the mother. Since boys in kindergarten, elementary school and other schools are dominantly taught and taken care of by women at an early stage in life, some boys end up with a fatal development of their image of what makes a man a man. “When boys are three or four years old they understand the consistency of gender which means that they are boys who have to become men one day. That’s why they search for information about what men are – but basically they don’t even have a real role model: How are men actually? Just normal guys made out of flesh and blood? Instead they experience day in and day out what women are like. And the women in their environment present a lot of what is considered to be totally human. They’re caring, sad, helpless, sometimes angry and sometimes affectionate. And boys subconsciously draw the conclusion that all these feelings are typically female, thus not masculine. In order to go through the metamorphosis from boy to man they block out these feelings or literally separate them from themselves. 2. It’s important to find one’s own role as a father. 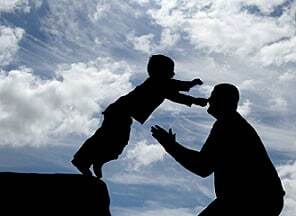 The role of the „equal father“ (type 3) has developed itself as a reaction to the traditional, patriarchic father figure which many men have suffered from as children. Now they try to be a better father. On the one hand that’s positive because it makes these men and their kids feel good to experience more bonding. But it can also lead to exaggeration, if the man doesn’t dare to put his foot down to avoid being authoritarian like his own father at all costs. In order to find one’s own role as a father it takes one essential step in my point of view: reconciling with one’s own father. This can be a long, painful road to take. A road you usually have to take on your own because the real father has died or is still alive but continues to block emotionally. “The exhibition and marketing of my private life by a third person is something I consider to be inappropriate,“ was the reaction of the former German chancellor on the book his son wrote. 3. The source of manhood lies in the relationship to the father. “When a man weeps during a therapy session, it almost always hast o do with his father“, is what the authors Dan Kindlon and Michael Thompson found out when they analyzed the world of male emotions. And when the favorite team is relegated is something I also want to mention. And what kind of father are you? ← Companies need “tempered radicals“. Do you have what it takes?